Nose: Big vanilla like a Van Winkle wheater, and black tea, but just a touch. Orange peel and coriander. On the palate: Medium bodied, light, but pleasantly so. Sweet, more orange peel, leather, sweet cinnamon, some heat, but never rough. Complex, balanced and elegant. Finish: Warm, with more sweet cinnamon and potpourri flavors. Leaves the mouth all tingly. Parting words: Rock Hill Farms is one case in which it pays to judge the book by its cover. 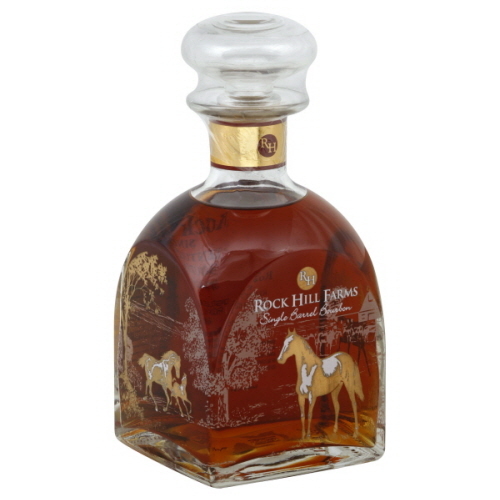 It comes in one of the most elegant decanter of any bourbon on the market, and it tastes like the sort of drawing room bourbon it looks like. The biggest drawback the standard issue Rock Hill Farms has is its price, $55 for a 100 proof NAS in the state of Michigan, and that’s before taxes. The Kahn’s edition is better than the standard version, and the last few times I’ve purchased it, it went for $45 before taxes. For a bourbon this suave at 100 proof, that is a pretty good deal. But you don’t have to take my word for it. Last spring I bet a bourbon buddy of mine a bottle that Purdue would make it further in the NCAA Men’s Basketball tournament than his Ohio State Buckeyes. I lost and sent him my bottle. He fell in love with it and now wants me to pick up a case of the stuff up for him next time I’m in Indianapolis. Kahn’s Rock Hill Farms is highly recommended.